MOST SLEAZE ROXX READERS WILL KNOW THE NAME BRENT MUSCAT FROM HIS DAYS AS ONE OF THE GUITARISTS IN FASTER PUSSYCAT. 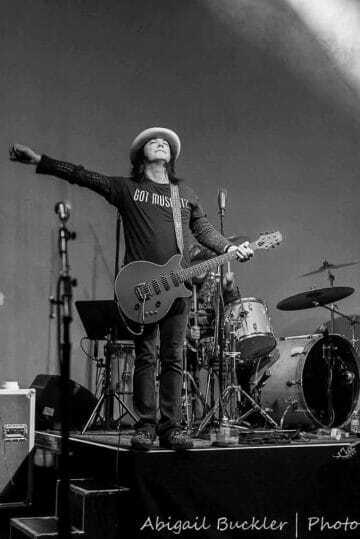 SINCE THOSE EARLY DAYS, MUSCAT HAS REINVENTED HIMSELF SO TO SPEAK BY MOVING TO LAS VEGAS, HELPING TO PIONEER THE GREAT ROCK N’ ROLL SCENE THAT IT CURRENTLY HAS, CO-FOUNDING THE SIN CITY SINNERS AND NOW SPEARHEADING THE SAINTS OF LAS VEGAS. 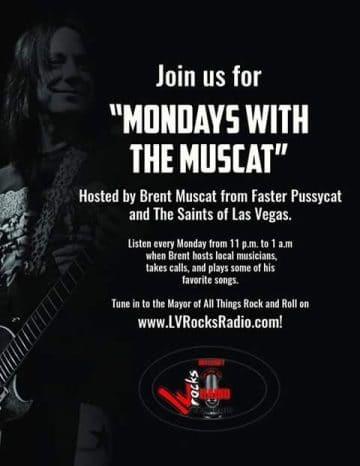 EIGHT YEARS LATER (HOW TIME FLIES), SLEAZE ROXX HAD THE OPPORTUNITY TO CHAT AGAIN WITH MUSCAT ABOUT HIS MANY PROJECTS INCLUDING HIS NEW RADIO SHOW/PODCAT ‘MONDAYS WITH THE MUSCAT’, HIS NEW BAND THE SAINTS OF LAS VEGAS AND OF COURSE HIS PAST IN FASTER PUSSYCAT AND LA. GUNS. Sleaze Roxx: You are a busy man! Let’s start off with your new radio show/podcast ‘Mondays with the Muscat.’ How did the opportunity come about and what have you and will be covering on your radio show? Sleaze Roxx: Did you have any prior experience in the radio industry and if so, what was it? Brent Muscat: Before this, the only experience I had with radio was all the junkets I used to do with Faster Pussycat. Radio is very fast. Things can go quickly, so I am used to that. I think internet radio is different of course, because you can really can control the content of your guests and what you want to say as a host and artist; and also there is a lot more obscenity now [laughs]. It’s get a little wild in the studio but we have such a good time. At first, the musicians and other guests were a little put off because there is a camera… You can watch the show also as it is broadcast live. I had Todd Kerns in a few weeks ago and he said, “Oh, boy. This is for real. I didn’t know there were cameras, too,” but everyone just goofs off. We have a little controversy, but that’s just when we discuss the local scene here in Vegas and how to make it better. Sleaze Roxx: Another new venture that you have is The Saints of Las Vegas but it does not seem that new with a lot of familiar faces that you have worked with in the past. How did this new band come about? 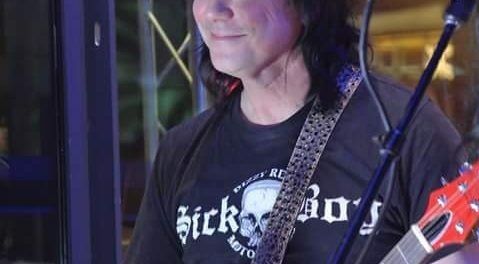 Brent Muscat: In 2015, I left the band I founded [Sin City Sinners] with Todd Kerns. 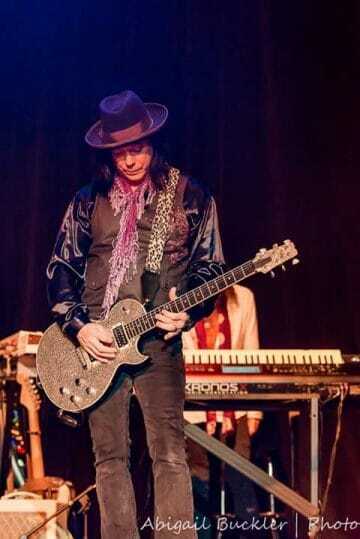 He had been on the road with Slash and we had great singers that followed including Zachary Throne and Joshua Alan who is now the lead singer of Ratt. However, after eight years, I felt that my creativity was a bit stifled. I pretty much came to expect the same thing, gig after gig. I knew I wanted to do something different in which I didn’t let, say, a manager, have control over. I took some time off to decompress and did some other gigs with other people who were friends of mine, and I also played some events for New Year’s and my birthday, which we jokingly called “Brentapalooza.” It was a huge success and then I realized that I wanted to continue with music. I met Anthony Serrano when I was watching him jam with his former band. He’s very young, but extremely talented. He is a great guitar player and a great singer, and he’s like a sponge. He can learn anything. I saw him, and he was a bit green, but I knew he had star quality. He hasn’t proven me wrong. Rob Cournoyer, the drummer, was with me in my former band for eight years in Vegas, and when he quit after me, I knew I had to grab him before anyone else did. Rob can play anything, anywhere and has a sense of humor that is very important to the success of The Saints. 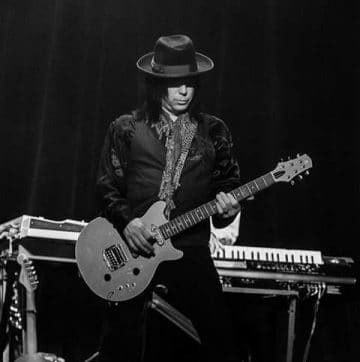 Brian D. Litton has been a musician for many years, going back to the Sunset Strip era, and like many of us, made his way to Las Vegas. He’s had a lot of successful bands here, also, and he was recommended to me by several people. Brian has the look, and can basically play anything…. country, metal, pop rock and funk, which is awesome. Sleaze Roxx: What’s the plans moving forward for The Saints of Las Vegas? Brent Muscat: Well, we have just started writing songs. Everyone in the band has different attitudes and influences so that is really cool. We’ve knocked out a couple of songs and put them on paper. So, of course a release will happen sooner, rather than later. We are so busy with our gigs. We’ve been fortunate to have a residency at the Hard Rock Café on the Strip for nearly a year now. We play there every Friday and Saturday and the staff and management have been nothing but kind and generous to us. We also play The Palms, and the House of Blues. We do corporate stuff, also. We had a big gig just five months after we began at the Johnny Cash Museum in Nashville. I know it sounds corny, but The Saints have been blessed with a lot of opportunities [laughs]. Sleaze Roxx: I noticed that some of the covers that you guys are doing are ’90s era songs. The big trend seems to be covering ’80s era tunes and certainly with your history in Faster Pussycat, it seems that that would be the logical thing to do. Why the ’90s era covers and which ones do The Saints of Las Vegas usually play? Brent Muscat: Well the ’90s thing started because Anthony [Serrano] is way younger than the rest of us in the band, [laughs] so that is his reference point. He’s turned the rest of us on to songs we would not have considered otherwise. We do Stone Temple Pilots, Bush, Weezer, etc. Now, of course, we are doing ’80s stuff too as people love to hear it, and we do some power pop. I do a Romantics song, which is fun… and unusual for me. That was forced on me, but now I really like to sing “What I Like About You.” The goal with The Saints is to bring smiles to faces. We are not dark and heavy. People should come to a Saints gig with a smile on their face and leave with an even bigger one. Sleaze Roxx: Speaking of Sin City Sinners, why did you end up leaving the band after all those years? 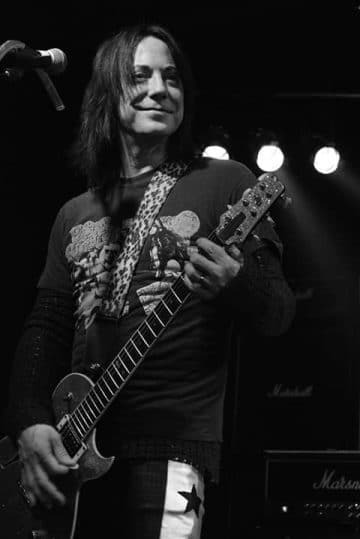 Brent Muscat: To set the record straight, Todd Kerns and I own the name Sin City Sinners. I left because I wanted new challenges and to be honest, it was not fun for me anymore. It became a grind, a long grind, and I wanted to have a vehicle where I could explore material that was different from the Sinners’ usual set list. Leaving the Sinners allowed me to do new things such as the radio show and the casino show I perform in called “One Epic Night” at the Plaza Hotel. I felt that in the Sinners, a certain party was disdainful of any other opportunities for me — and in fact people are coming up to me now and saying, “Dude, I wanted to ask you about another project,” but they were too afraid to ask. Now, people feel free to ask me anything, and I love to help out. Sleaze Roxx: Some people might not know this but you played in L.A. Guns over a couple of years. Although you played with the band for a couple of years, you never appeared on any studio album aside from the couple of live tracks on ‘Rips The Covers Off.’ How was your time in L.A. Guns and why didn’t you continue with the band? Brent Muscat: First, I have to say, so many people comment about that lineup of L.A. Guns, and how good it was. I was so proud of it. Looking back, I really do think it was fantastic. Our live shows were awesome. To tell you the truth, there was a talk about an album with me, Tracii and Steve, but then Tracii left to do Brides Of Destruction. Plans were still on the table for an album, but what happened was that Phil — and don’t get me wrong, I love him. He would call and say he was bringing a friend down to jam. So, that meant less work for me. Then he’d call again and say, he had another guy that was going to play too! So, that meant I wasn’t going to play as much as I wanted to. It went from say, ten songs, to six songs, to four that I was supposed to be on. That’s it in a nutshell. Phil and I are still friends. He lives here in Vegas and we play together occasionally. Sleaze Roxx: When you were last interviewed by Sleaze Roxx back in 2008, you had indicated that Faster Pussycat was dead to you starting in 1993. Do you still feel that way? Brent Muscat: We reunited at the Cathouse in 2015. 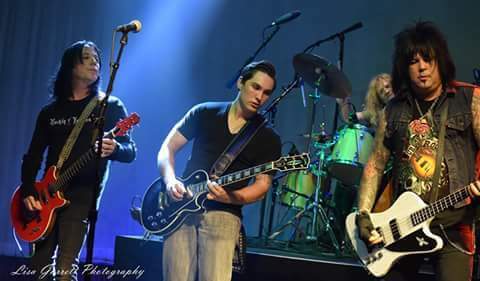 I loved being with my brothers on stage. I have no animosity towards the current line-up, but I think it’s disingenuous that Taime [Downe] hasn’t agreed to have me, Greg [Steele], Eric [Stacy] and him on stage again for a mini-tour or a few select performances. I was frustrated that our appearance last year looked more like a ten-piece orchestra than Faster Pussycat when the other guys stayed on stage. I love Ace [Von Johnson], but I think it could have and should have been the four of us with Chad [Stewart] on drums for a few songs. Oh well. Taime is Taime. But I have no ill will towards him. He does what he does. Sleaze Roxx: You’ve also reunited with Taime Downe via Sin City Sinners. Do you think that you’ll ever work again with Taime including doing a Faster Pussycat reunion in the future? Brent Muscat: Like I said above, Taime does what Taime does. I love him, and maybe one day. But the ball is in his court. He’s got my phone number. I have a lot of things that keep me busy, and I am very grateful about that. Sleaze Roxx: Do you keep in touch with any of the other classic line-up Faster Pussycat guys? When was the last time that you saw and/or spoke to Eric [Stacy], Greg [Steele], Brett [Bradshaw] and Mark [Michals]? Brent Muscat: Eric moved to Vegas! So it’s cool to have him here. He was on the radio show, and I love him like a brother. Greg, came to Vegas on New Year’s Eve last year and performed with me and Eric. I love him. He is doing great. I don’t really keep in touch with Brett and I don’t know where Mark is. That’s a mystery — the location of Mark Michals. Sleaze Roxx: You were able to reinvent yourself in the last ten plus years as a musician so to speak by playing covers and gigs in the Las Vegas area. Which have you enjoyed the most and why? Your time as a musician in Vegas, your time in Faster Pussycat or the time in between those? Brent Muscat: Wow. That’s an interesting question, and a very good one. All these different times were equally great but for different reasons. I was in Faster Pussycat when I was a kid, straight out of high school. Not many people at that age tour the world, and see their face in magazines and on MTV and on videos. After that I had fun playing in Bubble, L.A. Guns and the Liberators, too. I just enjoying playing. Vegas has given me a great life. When I moved here, I didn’t know anyone, and I had to really network. I don’t like to brag but I have to say I was a pioneer in terms of musicians moving out here and creating a scene. 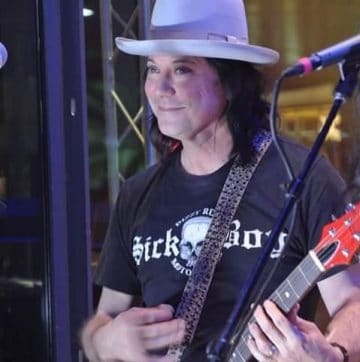 I don’t necessarily need a whole lot of credit, but I do think I was instrumental in helping the rock scene really grow in Vegas through co-founding the Sin City Sinners with Todd. A lot of musicians followed after they realized the cost of living is better, the venues are awesome and there is a great community. I think I played a big role in creating that community. Sleaze Roxx: Back in 2008 when you were interviewed by Sleaze Roxx, you had about 100 pages done for your autobiography. I assume that you have a few more pages done since that time [laughs]. What is the status of your autobiography? Brent Muscat: I still have those 100 pages. I have a writer friend who nags me into finishing it. She nags me all the time. One day I will. I think next year I shall. I will. I do think I have lived an interesting life and I am grateful for it. Sleaze Roxx: Is there anything else that we have not covered that you would like to mention? Brent Muscat: I am proud to say I am a cancer survivor. I have been in remission for over ten years now. When the doctors cut out part of my tongue and told me I would never sing or talk properly again, I knew I was going to prove them wrong. I learned to sing and talk again on my own, but I did it. I believe you can conquer almost anything if you try. I do my best to stay positive as much as possible. It’s much harder work to stay mean and negative. Be positive, it makes life easier. Sleaze Roxx: Last question for you — what are your three all-time favorite albums and why? Brent Muscat: Wow! My all-time three favorite records are — number one is ‘Anthology’ by Sly And The Family Stone! I just love him and his music so much. I would do anything to meet him and just shake his hand. He doesn’t get the credit he deserves for being the godfather of funk. Number two would be David Bowie’s ‘The Rise And Fall Of Ziggy Stardust.’ I am a huge Bowie fan. He was so creative and artistic. My favorite t-shirt that I always wear is my Ziggy Stardust t-shirt. Number three is [Devo’s] ‘Q: Are We Not Men? A: We Are Devo!’ It’s so catchy but it’s out there. I love it. Thank you very much to Lisa Jackson for facilitating the interview!